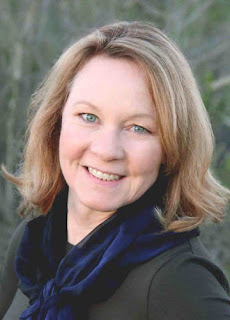 New York Times bestseller Meg Waite Clayton is surely one of the most generous and funny authors around. (Yes, this description includes the fact that Meg came to my rescue at the circus-themed Pulpwood Queens Book Festival, cheerfully using her mascara wand to dot on the freckles I needed to complete my clown outfit.) But really, Meg has done so much more. She tirelessly supports and cheerleads other writers and she's the person you want to go to if you want to talk about craft. Meg's newest book, The Wednesday Daughters is already a Top Summer Read from the Chicago Tribune and the Fort Worth Star-Telegram, and it's been picked by the Poisoned Pen British Crime Club. The Wednesday Daughters is an off-shoot from her bestseller, The Wednesday Sisters, but it really stands on its own two glorious and original feet. It explores the bonds that make and sometimes shatter a family, the way mothers and daughters can switch roles, hand down secrets, as well as dreams and identities. The story begins when Ally, one of the original Wednesday Sisters dies, and her daughter Ally enlists the help of two of the other "daughters," to come with her to her mother's writing cottage to offer support and help her untangle her mother's personal effects. But when Hope finds a stack of her mother's old notebooks, all three of this next generation will confront their own hopes, doubts, and grief. I'm thrilled to have Meg here to talk about her book, and even more, I'm truly honored to be her friend. Thanks, Meg for both! What made you return to the daughters of the Wednesday sisters? Did anything surprise you in the writing? I didn’t actually mean to write a sequel. I wrapped up The Wednesday Sisters with an epilogue, and thought I was done with their stories. But then I was talking with someone about his children, who are biracial, and it dawned on me that Ally’s daughter Hope would likely have faced the kinds of identity issues many children of mixed race do. I thought those issues would be really interesting to explore, and so many readers had asked if I would do a sequel that a sequel that involved the daughters of the original five friends seemed somehow meant to be. One thing that surprised me was the role Peter Rabbit author Beatrix Potter ended up playing in the novel—which in part arose from how surprisingly Beatrix potter turns out to be. I sent Ally (from The Wednesday Sisters) on a mission to write a Potter biography, and I thought that was going to be it—her doing research on Potter in the English Lakes. But Potter is such a delightful character that I wanted to do more with her. She shows up in Ally’s journal entries, in ways that completely surprised me, but were an absolute ball to write. Another was that Kath—who would not be made to do what I wanted her to in The Wednesday Sisters—took her own path again. I can’t seem to make her behave, which is I suppose the good news. It turned out to be such a warm pleasure to revisit these old friends—and to see them through the eyes of their grown daughters—that I find myself wondering if there might be another Wednesday book of some sort, someday. There's something so mesmerizing about the relationship of mothers and daughters, what we think we know verses what we need to find out. As Hope and the other Wednesday Daughters go through Hope's recently deceased mother's letters, they don't just confront her life, they confront their own. What do you think makes our mother-daughter bonds so important? Do you think we need to find a new way to navigate those relationships. The fact that I revisit parent-child relationships here, having already considered them from various angles in all three of my previous novels, suggests how important it those relationships are to me, both as a daughter and as a mother. I think it’s particularly complicated for women of my generation, who grew up with 1950s-style mothers and are now trying to negotiate life as women in the 21st century. Some of us have chosen paths our mothers abhor. Some of us feel pressure to live the lives our mothers couldn’t, and so want us to. It’s impossible for a parent not to have dreams for his or her child. And yet at some point, we have to let go of our parents’ expectations for us, and then when it’s our turn, let our children loose to make their own mistakes. But sometimes I think we are getting worse at that rather than better. I only have sons, but I have to say that being a parent has completely changed my view of my mom. Who knew when we were growing up how hard what she did for us was? 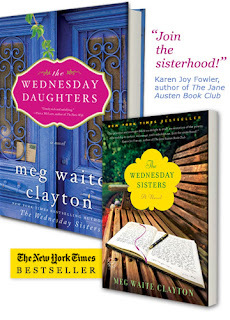 The Wednesday Sisters was certainly meant as an homage of sorts to my mom and her friends. It gave me an excuse to talk to her and explore what her life was like, and trying to put myself in her skin really changed my view of her—for the better. And I do carry her mothering and my own into everything I write. I even lift some moments from my journals, and then fictionalize them. Quite a bit of what children do in my novels has been done by my sons. So much of both these books are about writing, what it means to us, how it frees and sustains us. How much of what you think and feel about writing finds its way into your characters? I think the best writing comes from exploring what we are passionate about, and I’m certainly passionate about writing. I’ve come to know myself so much better as a writer than I ever did before. And that was true long before I started publishing. In some ways, it’s easier to be your genuine self writing before you’re published, when there are no expectations for you. So I dip into that emotional space pretty regularly through my characters—I suppose in part to invite readers to try it themselves. (Really, jump in, the water is fine!) But like most writers, I came to writing first as a reader, and so much of how I think and feel about writing has roots in my love of reading, and the books that have really made me who I am, or at least brought out whatever good there is in me. When I sit down to write, one little part of me is Scout Finch. What's your writing life like? I'm always interested in process, maybe because part of me always worries that I could be sharper, clearer, or that I'm somehow doing it wrong. What's your process like? Do you map things out, fly by the seat of your pen, follow your muse? My answer to pretty much all the “do you” questions about writing is “yes.” I start any way I can, often in my journal. Since no one but me reads them, the pressure is off, which I need when I’m starting a project. Often I just sit down and write a word—any word—and hope other words will feel sorry for it and come sit beside it, in the next empty space. And once I spill ink, the words do come eventually. So the one rule I have for myself is to sit down and write every day. 2,000 words, or 2:00. One of the things I find very helpful for writing an ensemble novel is a character scrapbook. It is, quite literally, like your high school scrapbook or a scrapbook from your childhood—a collection of all sorts of bits that help me define each character. It often starts with pictures I’ve torn from magazines. I start with the physical, but it’s not one picture of a person, it tends to be one person’s eyes and another person’s nose and another’s physique and another’s wardrobe choices all put together on the page. I set aside pages for each character, and for settings, too. There are also things nobody needs to know—like what car they drive or who their childhood boyfriends were—but it helps me to flesh out the characters in a way that makes them feel real to me. They need to feel real to me for me to make them feel real for the reader. I also add snatches of dialogue. And I continue adding to the pages of the scrapbook as I go along. I also use outlines and flow charts. One of the things I find useful about a flow chart set up by chapter and character is that you can see if, perhaps, you haven’t touched on any particular character’s story in four or five chapters. It’s a very helpful visual aid. Also, in my office, I surround myself with inspiring, thought-provoking pictures. Chocolate. No, seriously. Chocolate. I’m thinking of using it in a big way in my next novel. My favorite thing to cook has always been brownies, and I once received a marriage proposal based on the fact that the suitor in question would get to eat my brownies until death did us part. Now I’ve got my eye on a class in making fancy chocolate candies.